I am blogging from the Hard Rock Cafe in New York. It is right on Times Square and let me tell you, this place is hopping. Servers are hustling and food is coming out of the kitchen quickly. This Hard Rock Cafe would be difficult to miss. It's classic sign glows on the New York City street. The address for the Hard Rock New York City is 1501 Broadway, NY. I didn't think to make a reservation, so we had to wait 15 minutes for a table. This gave me time to wander through the gift shop while trying to remember my budget. So far I've seen the Hard Rock in Washington, D.C., Gatlinburg, Baltimore and NYC. They're all fun. Memorabilia lines the walls and rock music plays in the background. The nice thing about chain restaurants is that you pretty much know what you're going to get. There weren't any surprises here and that's just what we wanted. Enough of that. Let's talk about the meal shall we? I ordered the hickory smoked barbecue sandwich and asked them to hold the bread. Remind me to be specific next time. They held the bread, but still sent the lettuce etc. I chuckled and pulled it out from under the large scoop of pulled pork. 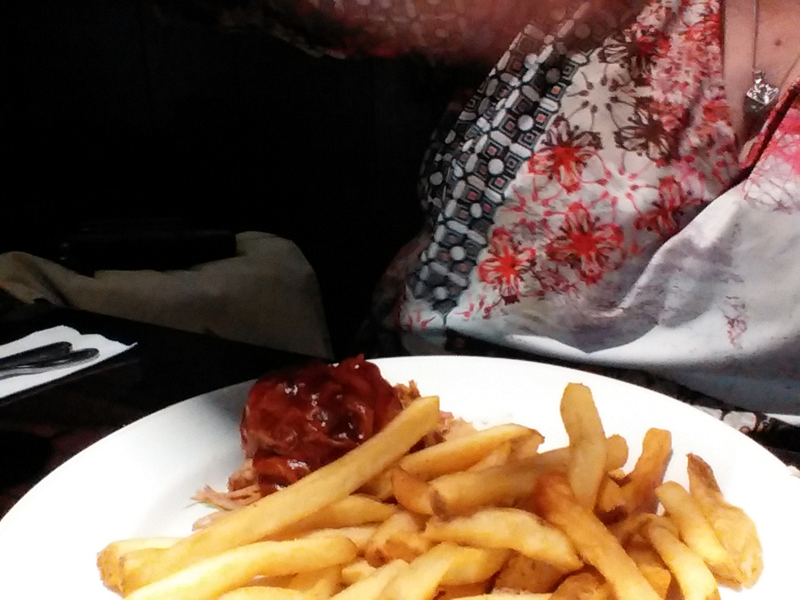 The Memphis style barbeque sauce was flavorful without being overly spicy. Ummm. Ummm. It was good. According to the Hard Rock Cafe New York menu, the Hickory-Smoked Pulled Pork sandwich is supposed to come with seasoned fries, baked beans and citrus coleslaw. You can see from the photo that mine did not. I told the server about my onion allergy and asked about the coleslaw. It didn't arrive and neither did the baked beans. We didn't see the server again until the checks came. By then the meal was finished and we were ready for sightseeing. I didn't ask about the missing sides. My guess is that they both contained onions. Who knows? I will say that the fries were hot, plentiful and delicious. The Hard Rock New York puts out a killer Hickory-Smoked Pulled Pork Sandwich at a dynamite price. It was only $15.50 - a bargain by NYC standards. Add iced tea, take off an AAA discount and toss in tip for an unbeatable $19.97. Reservations would have helped us, but we were in and out in time to make the tour with Go NY Tours. Dinner was good. I wish the sightseeing had gone as well.